The delinquency rate for mortgage loans on residential properties was 4.77 percent of all loans outstanding — unchanged from the previous quarter. 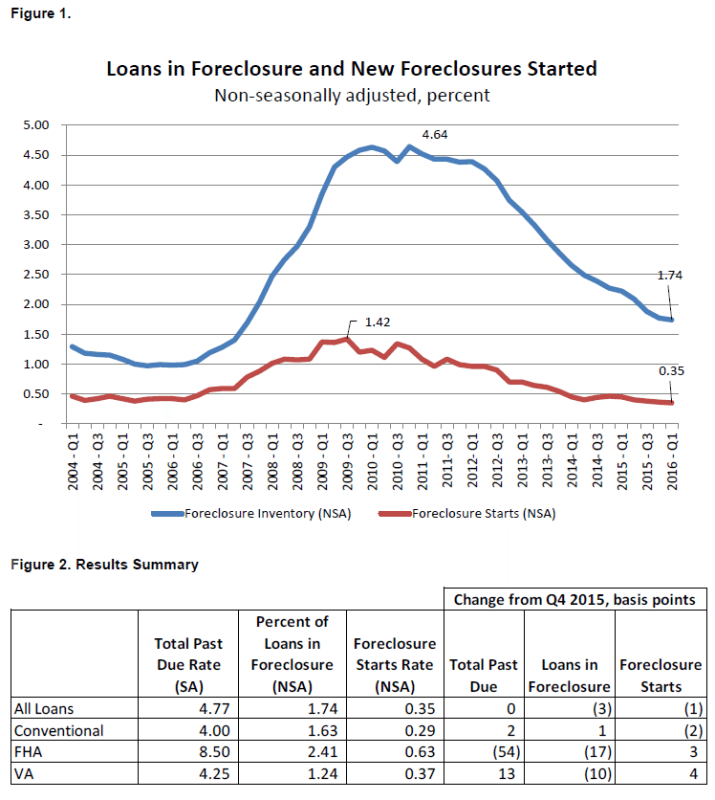 Foreclosure actions were started on 0.35 percent of loans in Q1, a decrease of one basis point quarter-over-quarter and down 10 basis points year-over-year. The serious delinquency rate, the percentage of loans that are 90 days or more past due or in the process of foreclosure, was 3.29 percent, a decrease of 15 basis points quarter-over-quarter and a decrease of 95 basis points year-over-year. The Market Composite Index increased 0.4 percent week-over-week on a seasonally adjusted basis. On an unadjusted basis, the index increased 1 percent week-over-week. The average contract interest rate for 30-year fixed-rate mortgages decreased to its lowest level since April 2016, 3.82 percent, from 3.87 percent. Is there something wrong when youth must rely on family cash to buy? When can we expect the next Fed rate hike?